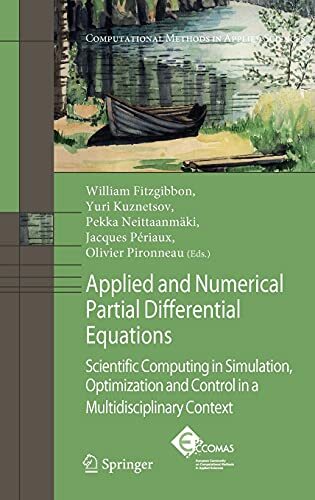 [PDF] Applied and Numerical Partial Differential Equations: Scientific Computing in Simulation, Optimization and Control in a Multidisciplinary Context (Computational Methods in Applied Sciences) | Free eBooks Download - EBOOKEE! Posted on 2017-10-09, by luongquocchinh. Description: The present volume is comprised of contributions solicited from invitees to conferences held at the University of Houston, University of Jyv?askyl?a, and Xiâ€™an Jiaotong University honoring the 70th birthday of Professor Roland Glowinski. Although scientists convened on three different continents, the editors prefer to view the meetings as single event. The three locales signify the fact Roland has friends, collaborators and admirers across the globe. The contents span a wide range of topics in contemporary applied mathematics ranging from population dynamics, to electromagnetics, to fluid mechanics, to the mathematics of finance among others. However, they do not fully reflect the breath and diversity of Rolandâ€™s scientific interest. No comments for "[PDF] Applied and Numerical Partial Differential Equations: Scientific Computing in Simulation, Optimization and Control in a Multidisciplinary Context (Computational Methods in Applied Sciences)".